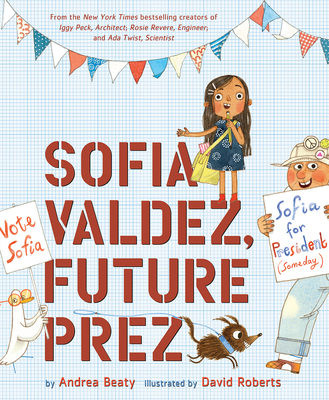 The newest picture book from the creators of Iggy Peck, Architect; Rosie Revere, Engineer; and Ada Twist, Scientist stars Sofia Valdez, a community leader who stands up for what she believes in! Every morning, Abuelo walks Sofia to school . . . until one day, when Abuelo hurts his ankle at a local landfill and he can no longer do so. Sofia misses her Abuelo and wonders what she can do about the dangerous Mount Trashmore. Then she gets an idea—the town can turn the slimy mess into a park! She brainstorms and plans and finally works up the courage to go to City Hall—only to be told by a clerk that she can’t build a park because she’s just a kid! Sofia is down but not out, and she sets out to prove what one kid can do. Questioneers Family Calendar, coming May 2019! Andrea Beaty is the author of the bestselling Questioneers series, among other children’s titles. She lives just outside Chicago. David Roberts has illustrated many children’s books, including the bestselling Questioneers series. He lives in London.